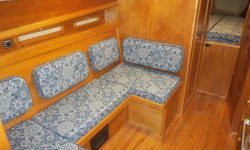 Back in January, I visited Lively Heels in the owner’s storage building so I could discuss with him the addition of a dinette table and possible conversion to a full-size berth. 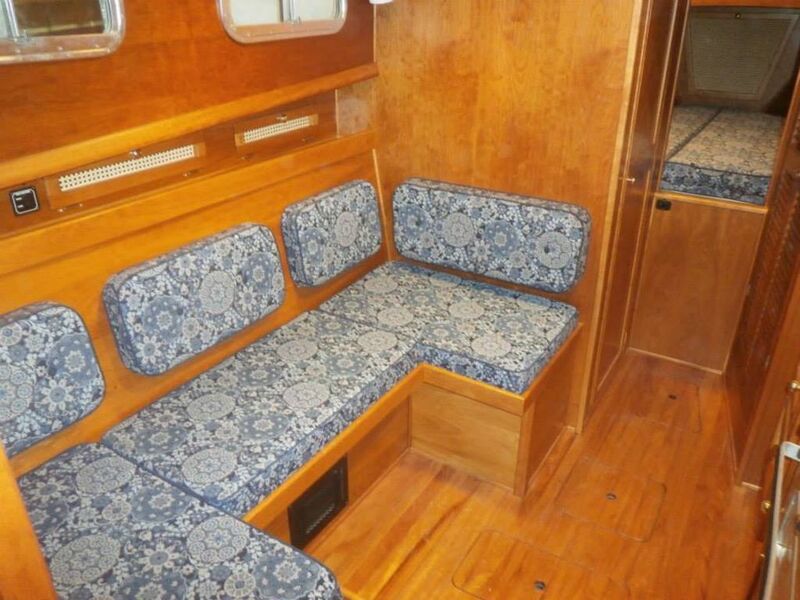 The existing space had been constructed to allow for a table with a 3-sided dinette seating area, but the table had never been installed. 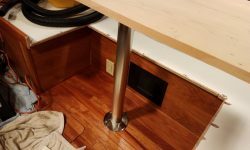 The outcome of our discussion at the time was that a basic pedestal table, sized to fit the footwell opening in the existing dinette, was the best option for the space and for the owner’s needs. 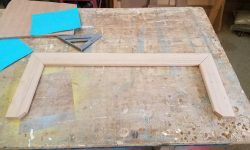 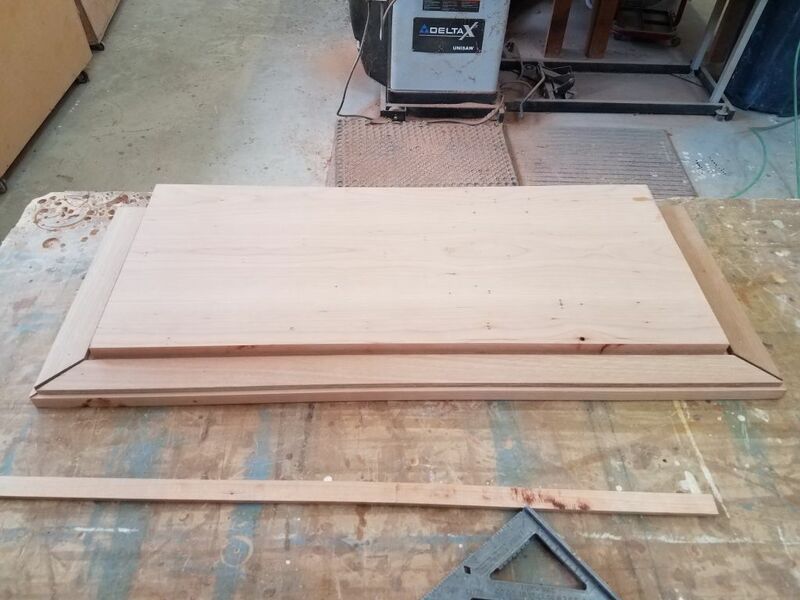 At the time, I took some basic measurements of the space and noted the details, and later, back at the shop, I spent a few hours preparing and dimensioning some raw cherry stock to glue up a blank for the new table top, along with some pieces sized for the trim I thought I’d need. 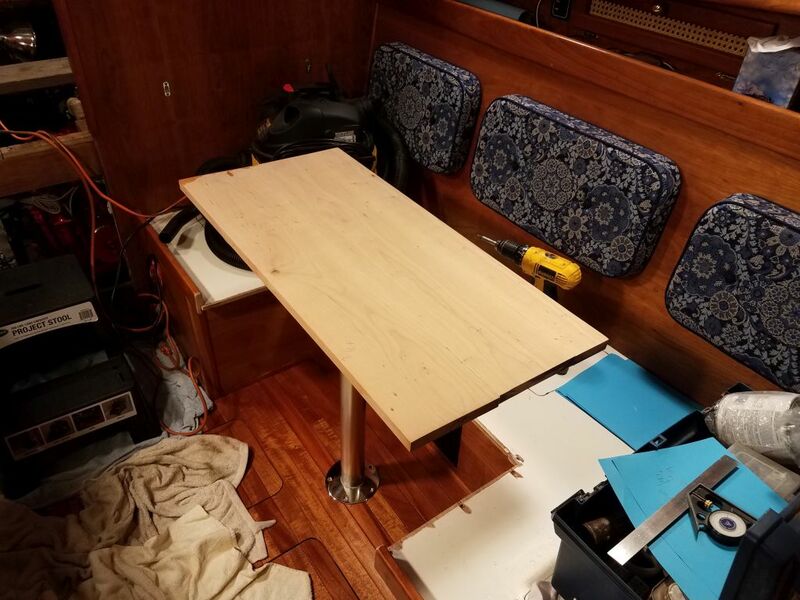 The table was to be removable and serve double duty as the platform for a berth filler cushion that would make the dinette into a larger lounging or sleeping area. 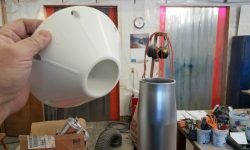 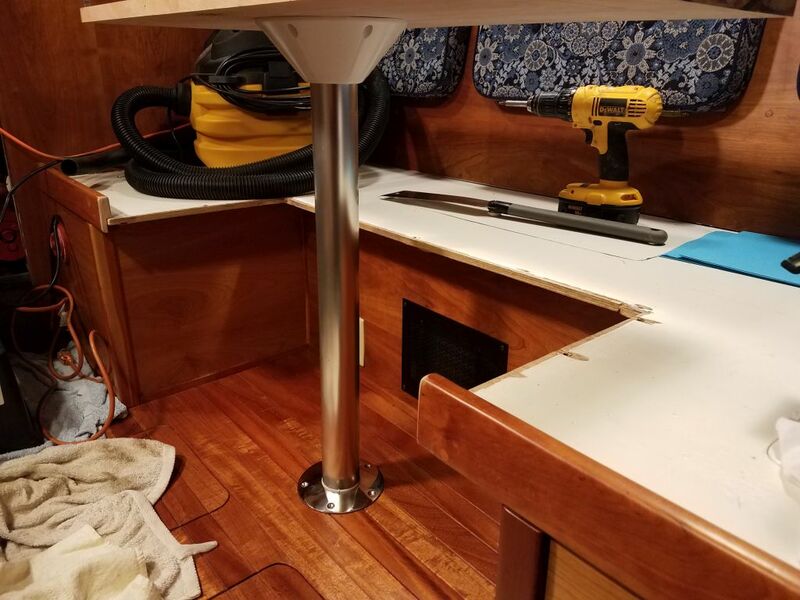 Standard table pedestals have traditionally left much to be desired in terms of strength, looks, and durability, so finding a decent yet simple pedestal for this application was an important task. 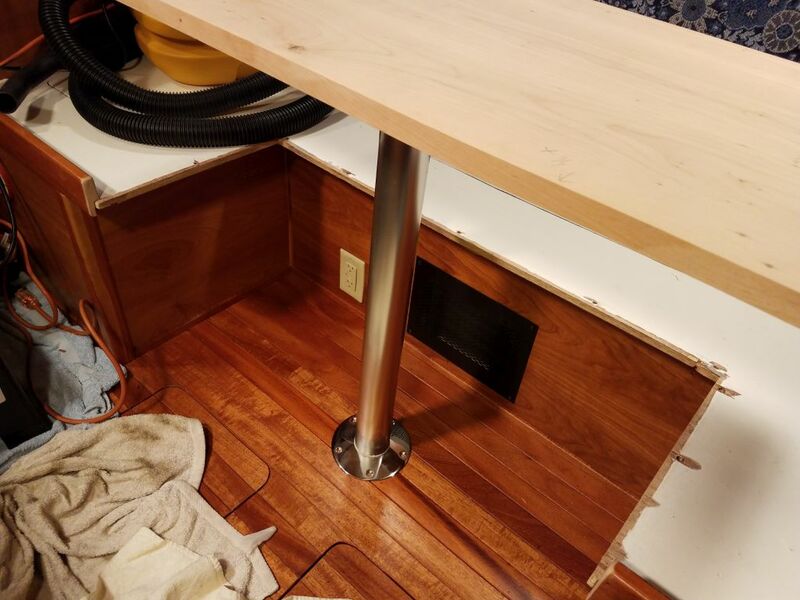 Complicating the installation in this specific case was the fact that the center of the existing dinette footwell, where a pedestal foot might be located, was directly over some beams that supported the cabin sole (I knew this because I built the interior originally some years earlier), and this obviated the use of any sort of flush or insert-type pedestal base. 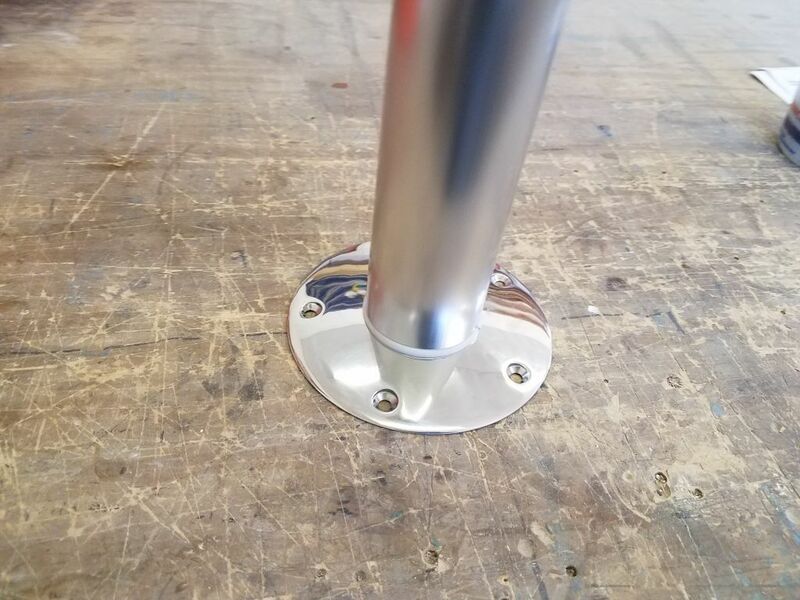 After some searching, I found a pedestal that featured an aluminum leg that fit into a neat-looking nearly flush surface-mount base. 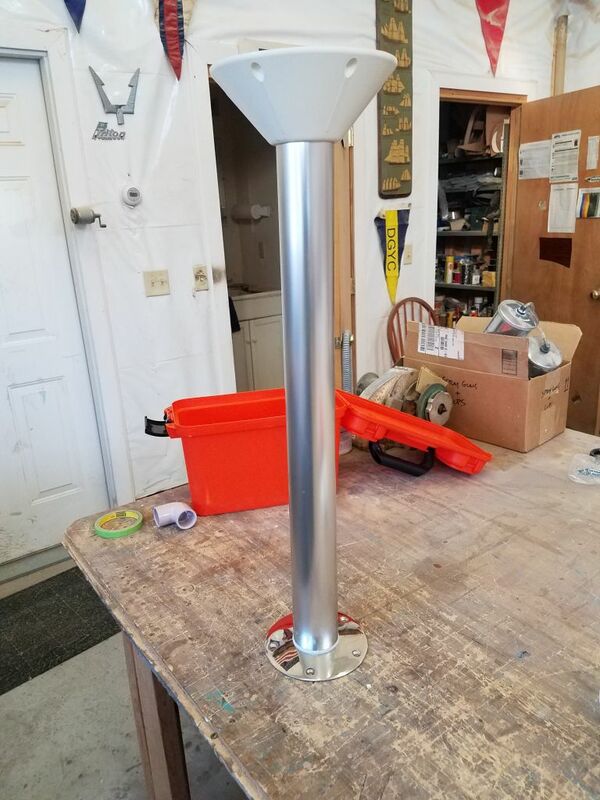 Intrigued, I ordered the pedestal so I could inspect it firsthand. 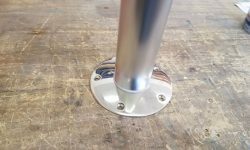 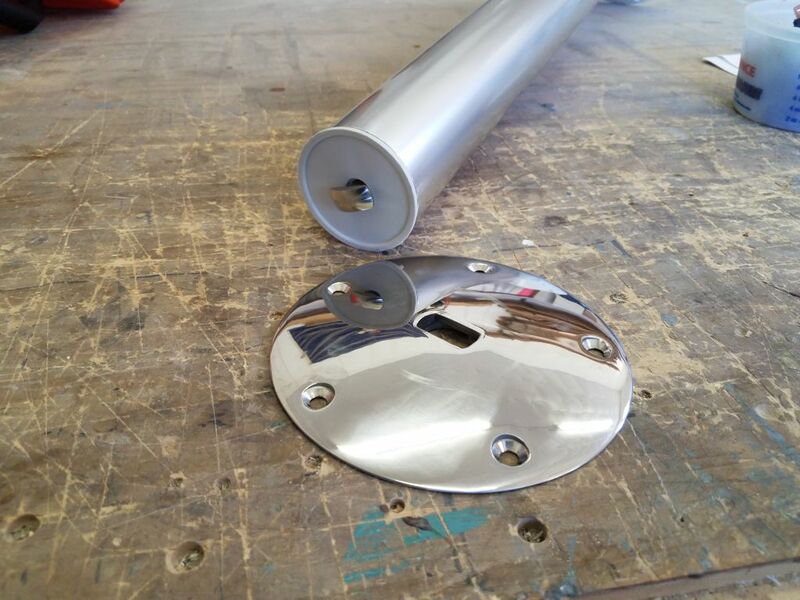 The base itself, made of stainless steel, was very low profile–a plus for this space since we didn’t want a bulky pedestal base in there–and had what turned out to be a highly effective means of securing the table leg tightly. 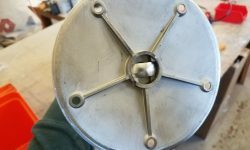 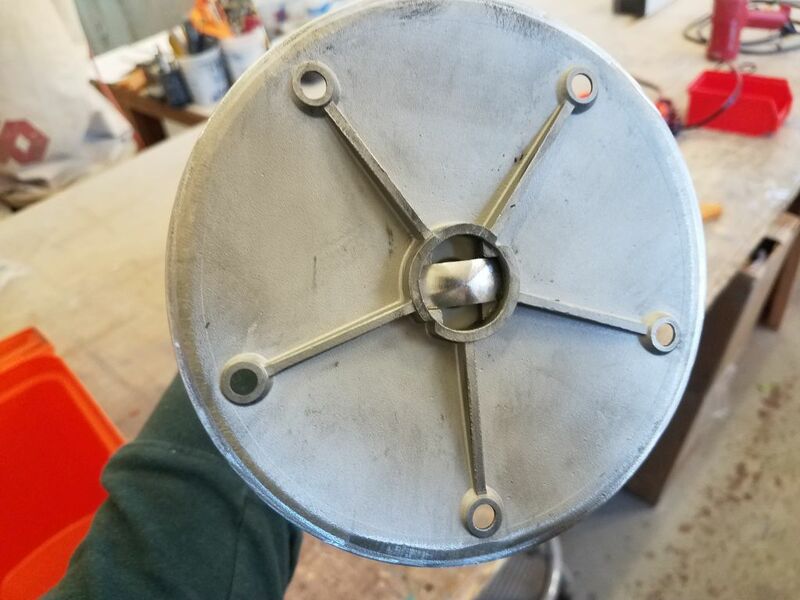 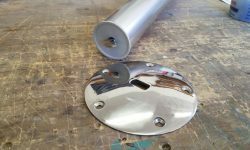 The top of the assembly was a plastic piece that would be secured to the table, and fit over a tapered section of the leg for a tight friction fit. 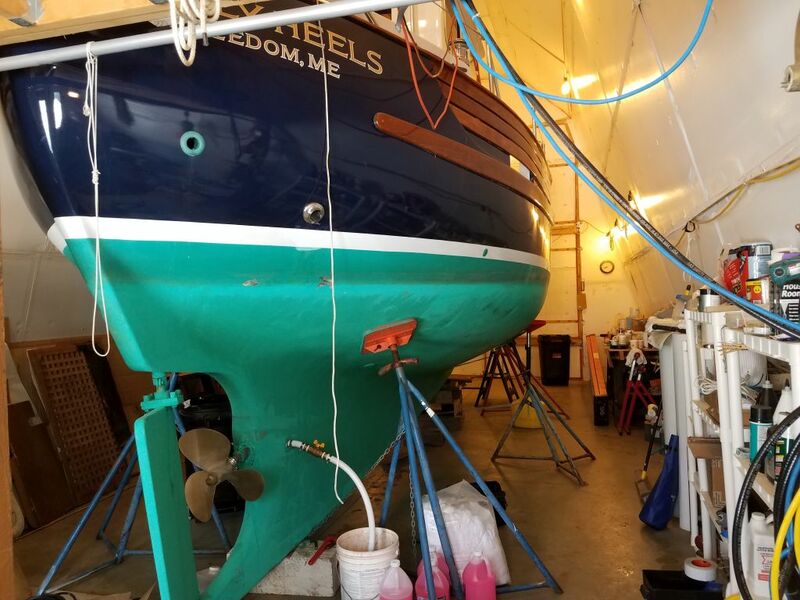 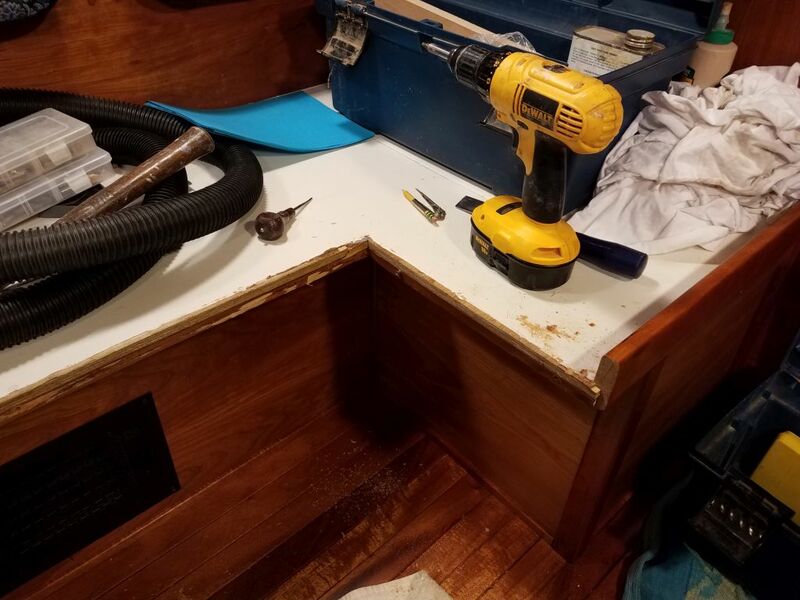 Later, after various scheduling and weather-related delays, I returned to the boat to prepare the space for the new work. 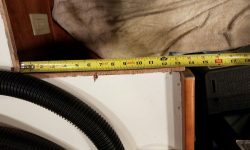 My task this day was to remove the existing fiddles from around the space, which would reveal the true size and shape of the opening that I needed to fill, and allow me to determine the various new trim profiles I needed to make up. 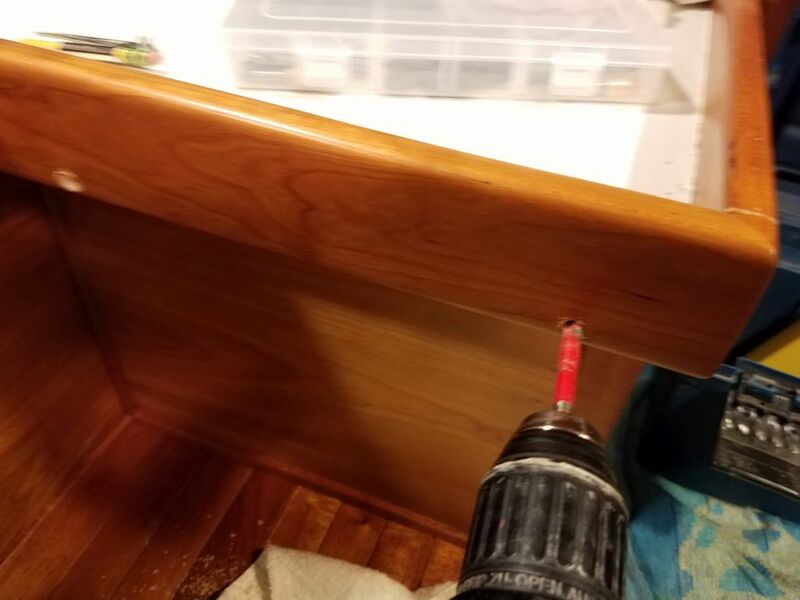 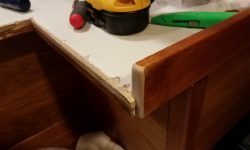 The existing cherry trim was mitered at the outside corners, so to make a clean end for the side trim that would remain in place, I cut through the trim just outside of the dinette area and existing miter cut. 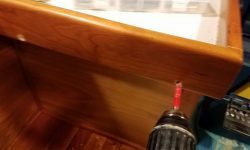 Next, I drilled out the bungs hiding the fasteners securing the fiddles in place, and removed the screws. 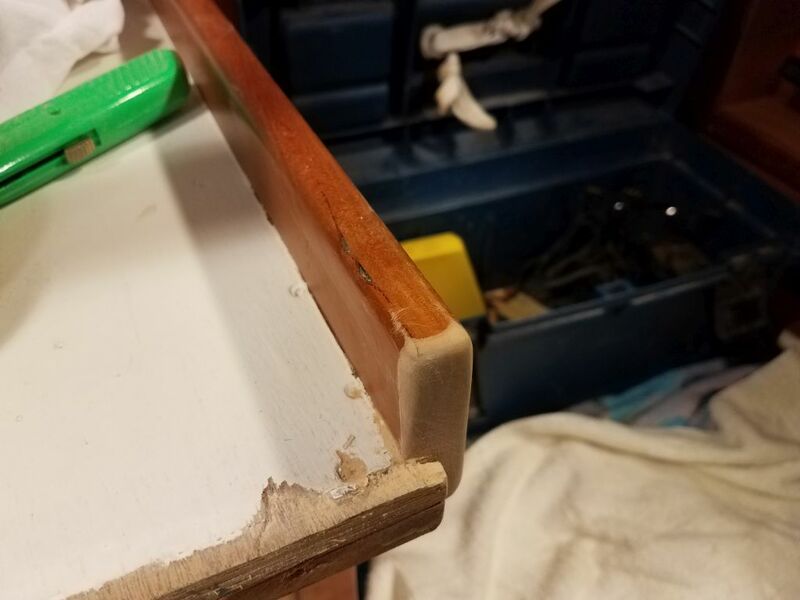 The fiddles were also glued in place, but with some care I was able to remove the pieces with minimal damage, so hopefully I could repurpose some of the hardwood later. 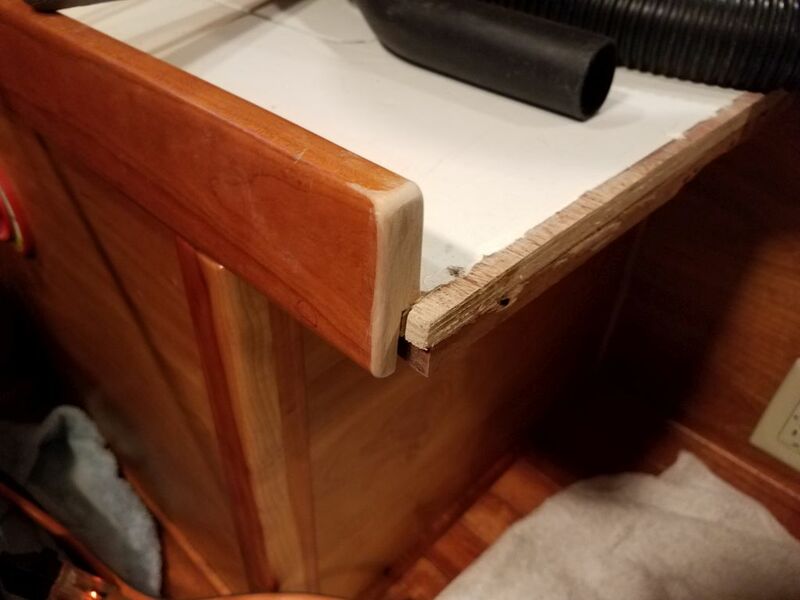 During the original construction, I’d installed a hardwood cleat beneath the plywood settee overhang to support the fiddles. 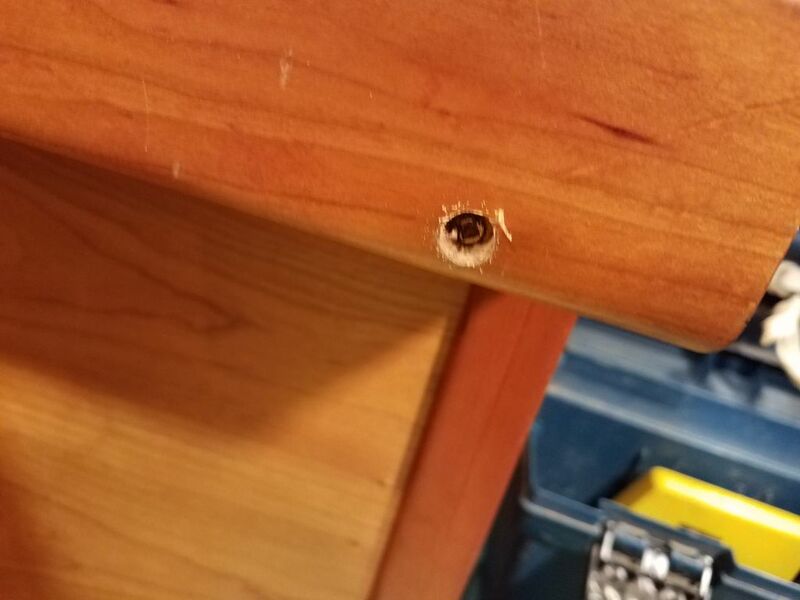 This was secured with glue and more screws. 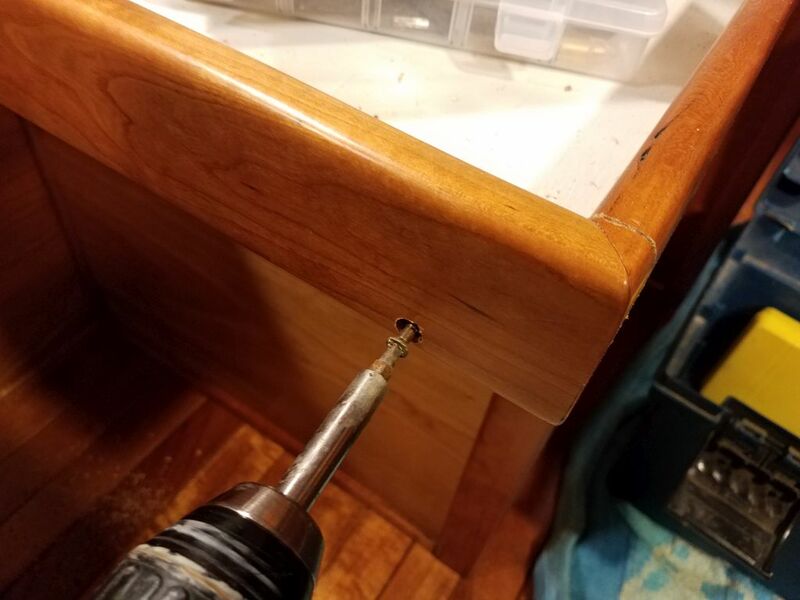 The screw heads on the settee were filled with paint, so I chiseled out the cleats from beneath and then used locking pliers to unwind the screws enough till I could grab and remove them from above. 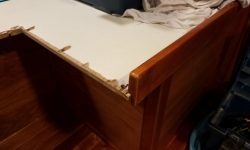 This left me with just the overhanging plywood settee top, which is what I wanted and would provide the clean start for the new trim. 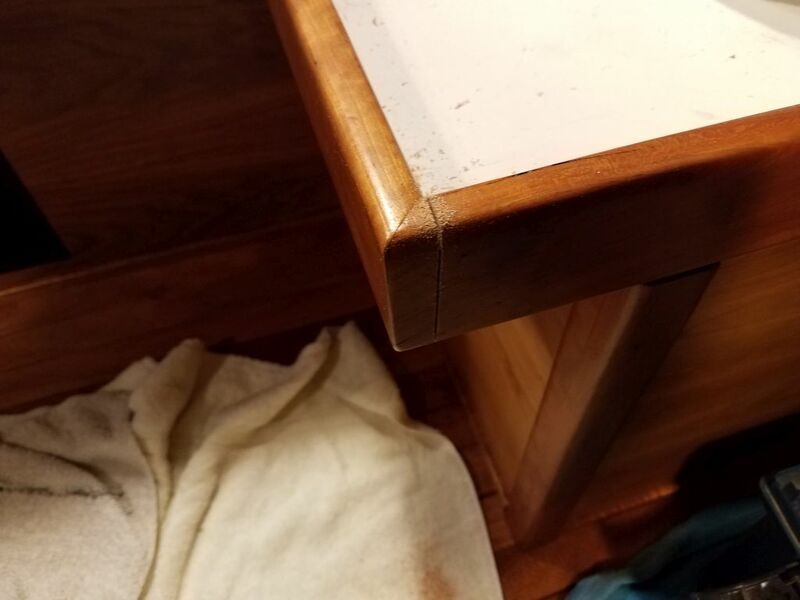 At this stage, I also sanded clean and rounded the edges of the remaining fiddles at the sides of the dinette, and applied a coat of varnish over the raw wood. 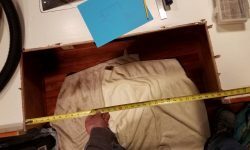 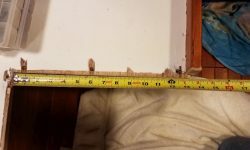 I made various detailed measurements of the opening for my future reference in building the new trim. 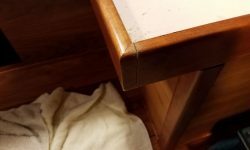 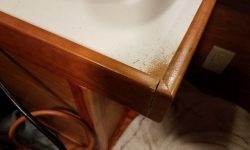 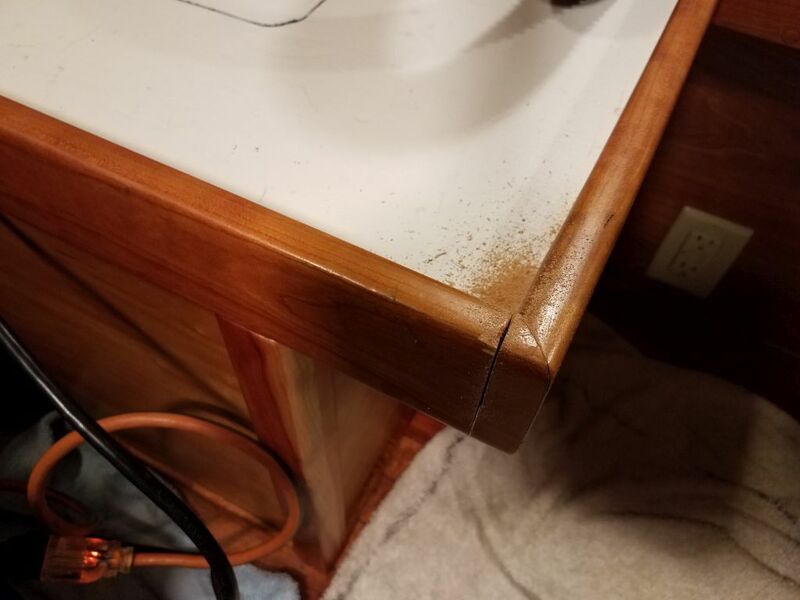 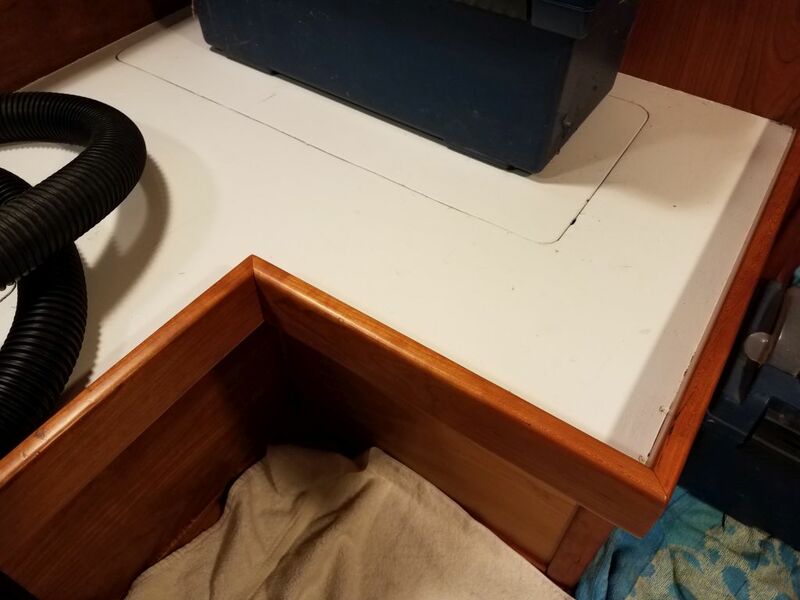 The trim would have to support the table top flush with the settee when lowered to the berth position, and also needed to cover the now-exposed plywood settee edge. 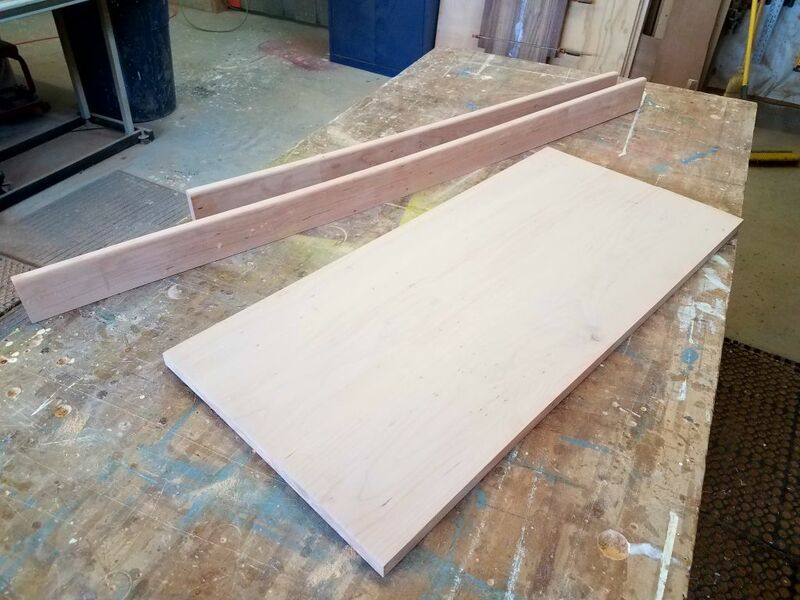 I planned to run the trim back beneath the existing overhang to give it plenty of strength, but I hadn’t worked out all the details of how I’d mill it just yet. 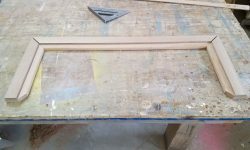 To give myself an accurate template of the exact opening, I laid the table blank across and traced the outline on the bottom side–the easiest way I could come up with to document the real space. 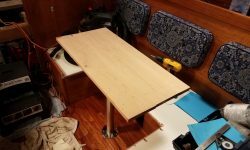 For visualization purposes and to ensure the table leg was the desired height, I set up the leg and table top, giving a sense of how it would work later, even though the table was still an oversized and incomplete blank at this point. 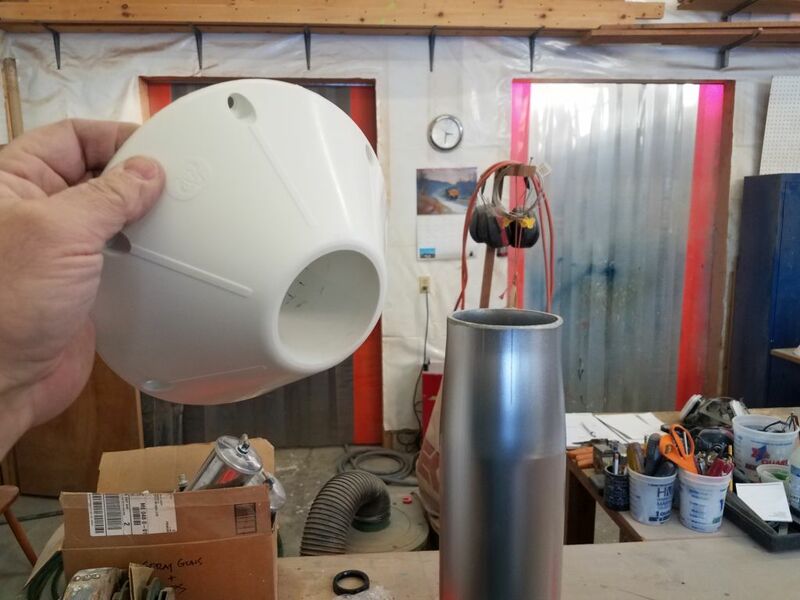 Back at the shop later in the afternoon, I got to work on the details. 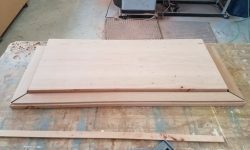 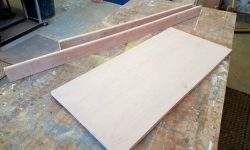 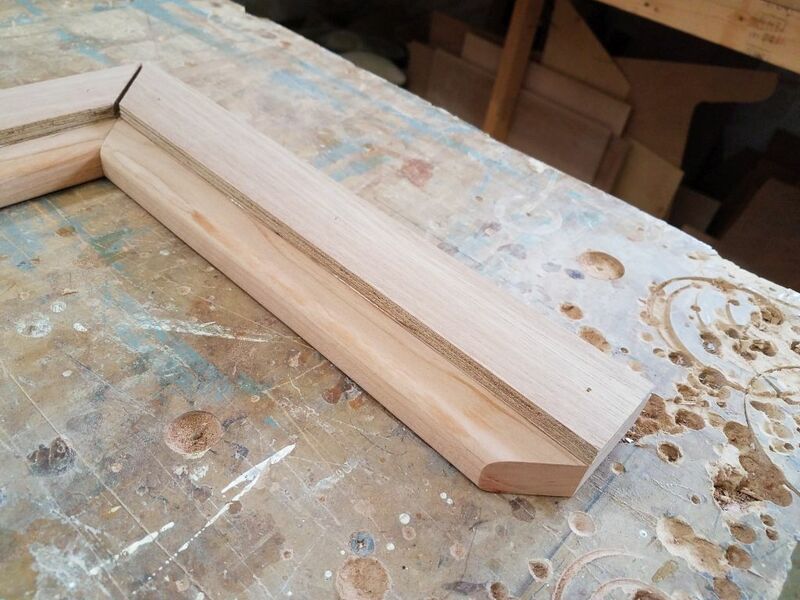 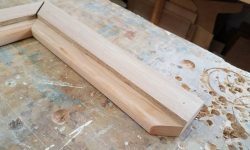 For the main support trim, I planned to use some 3″ wide cherry that I’d milled and sanded to a rounded profile on one edge. 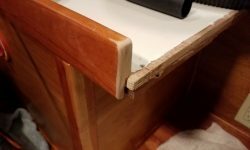 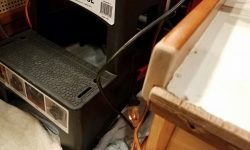 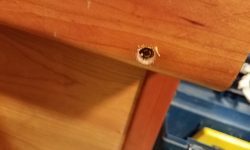 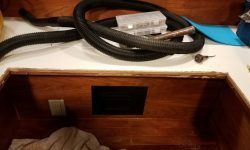 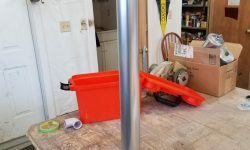 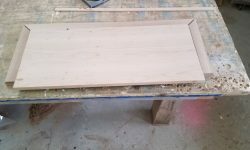 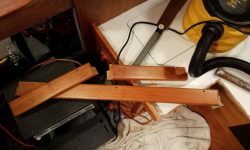 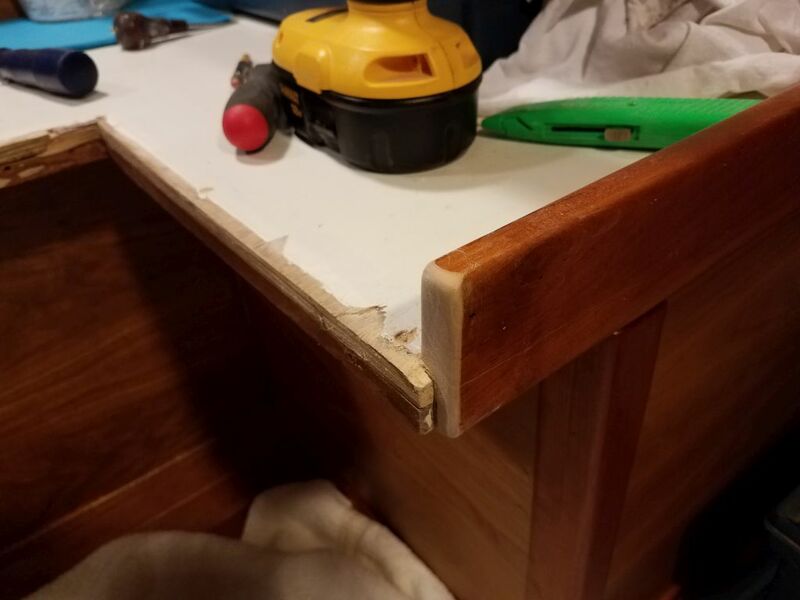 Allowing for a 3/4″ flat to support the table, plus 1/4″ vertical trim that would eventually hide the plywood edge on the settee, this would give me 2″ of wood to extend beneath the overhang for support; I could glue and bolt it in place for high strength. 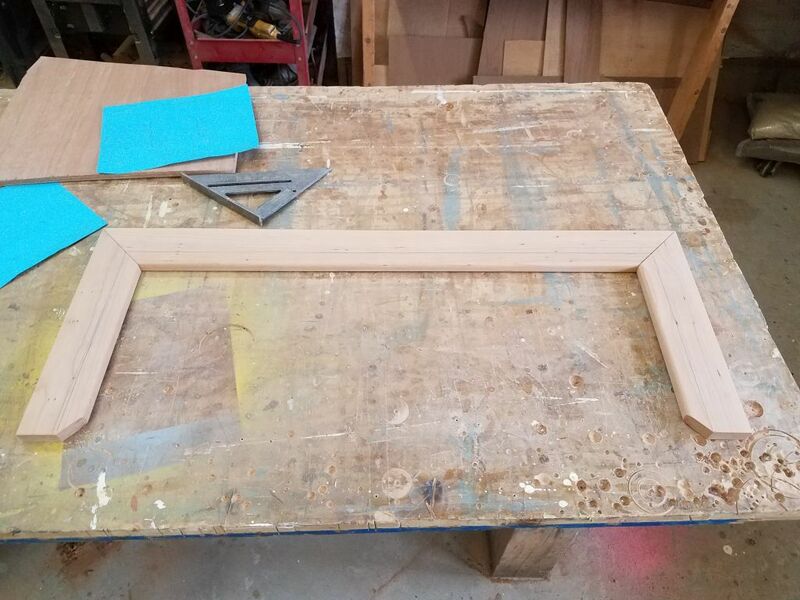 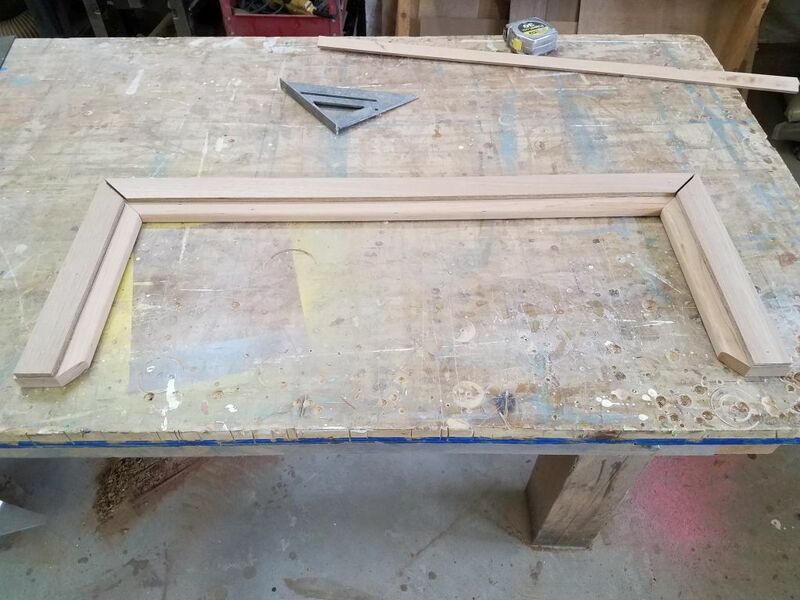 Using the measurements I’d taken earlier, along with the table template, I prepared three sections of this trim that would fit within the existing opening. 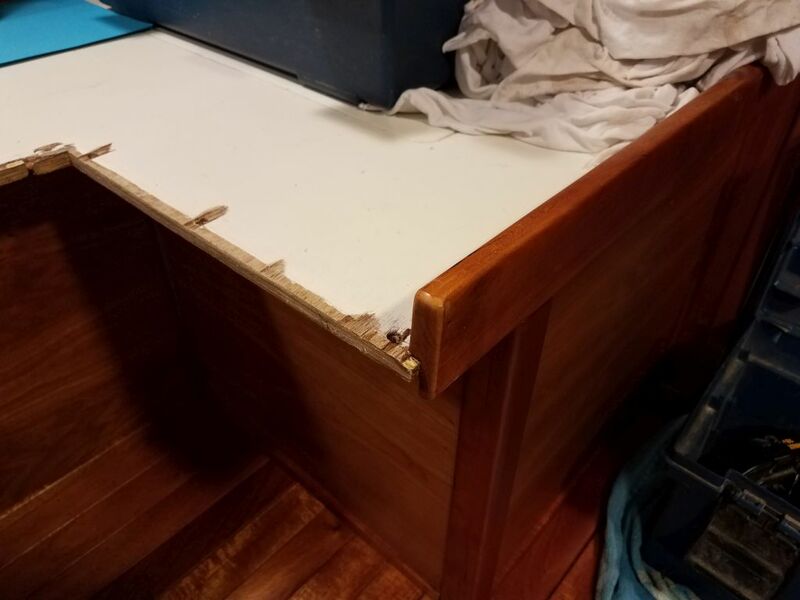 I left the side pieces a bit shorter than the actual opening so they wouldn’t project too far and run into some existing cleats, and beveled the outer edge so there wouldn’t be a sharp corner to catch clothing or legs or whatnot. 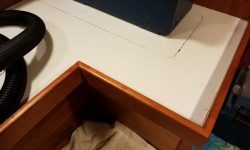 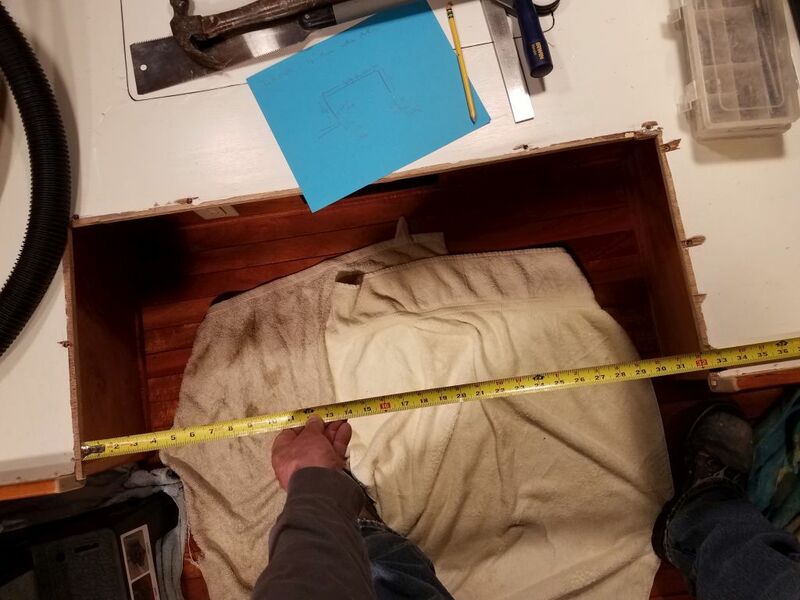 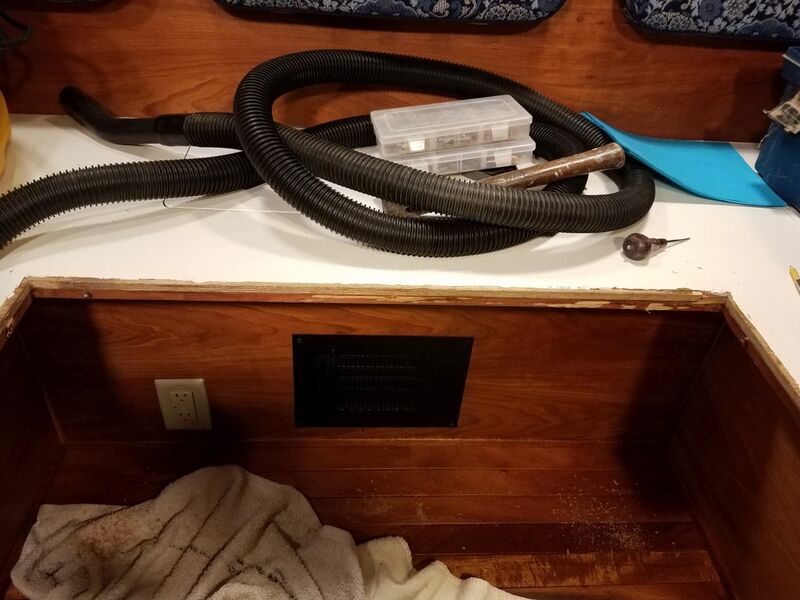 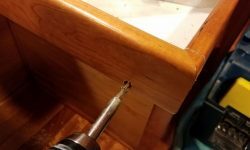 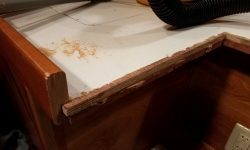 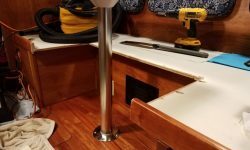 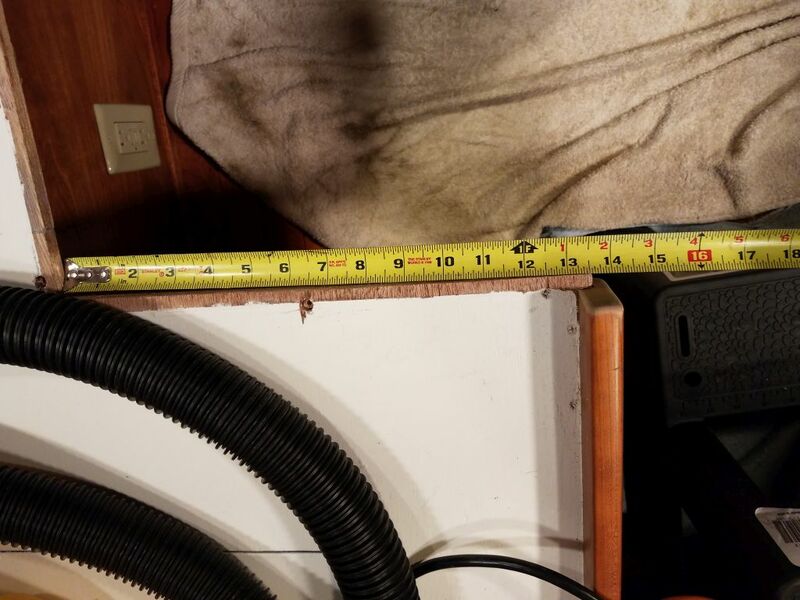 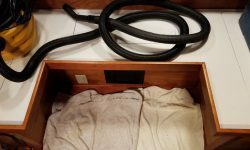 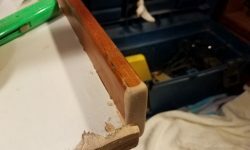 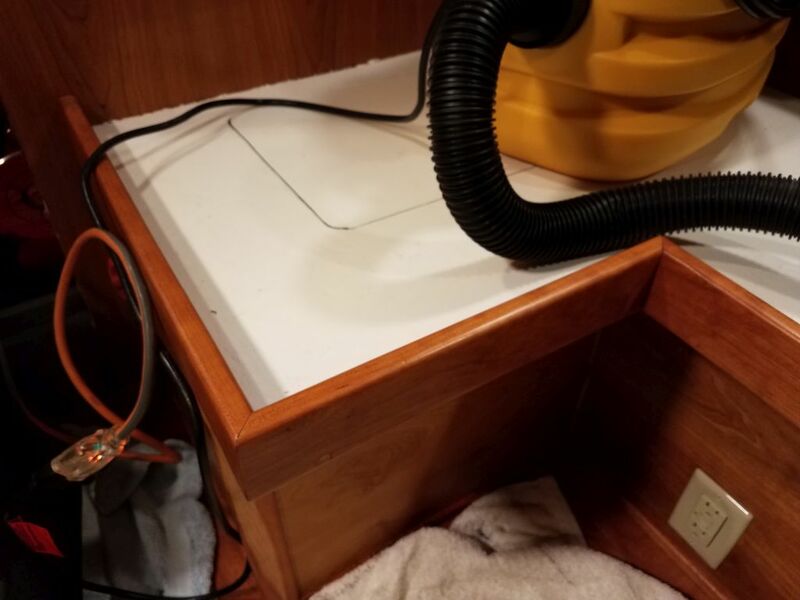 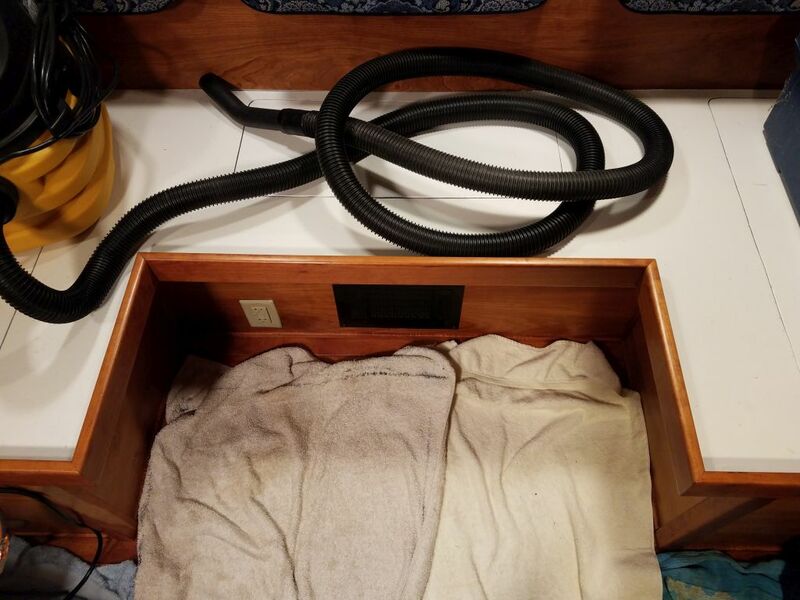 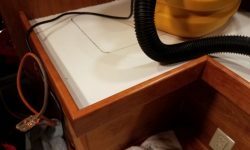 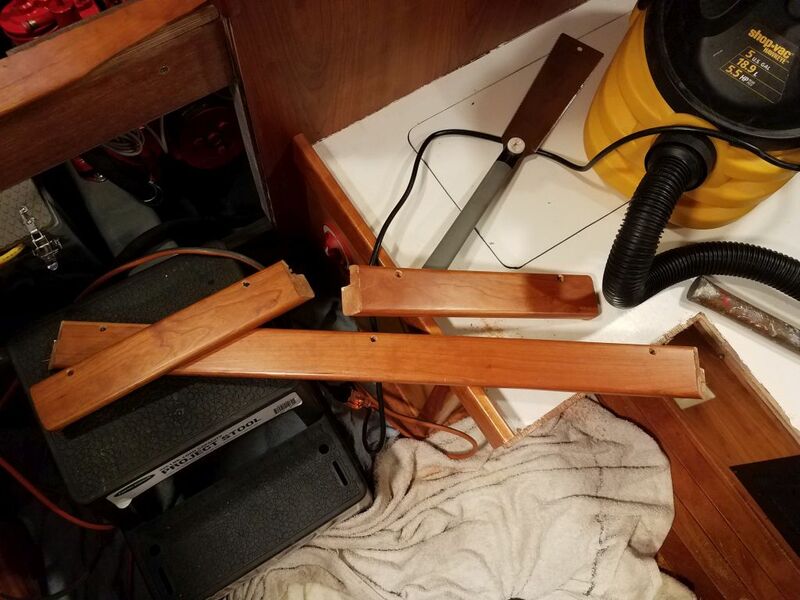 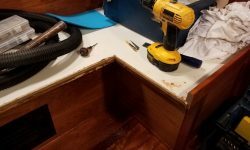 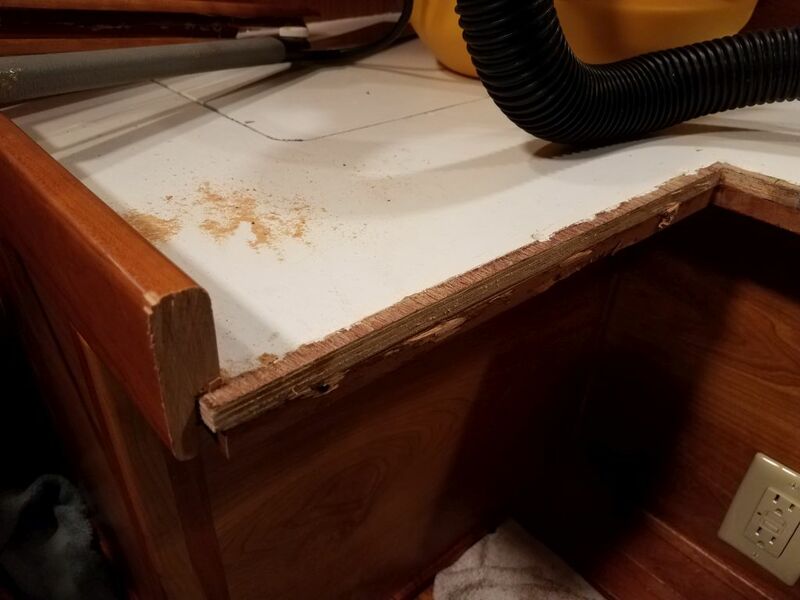 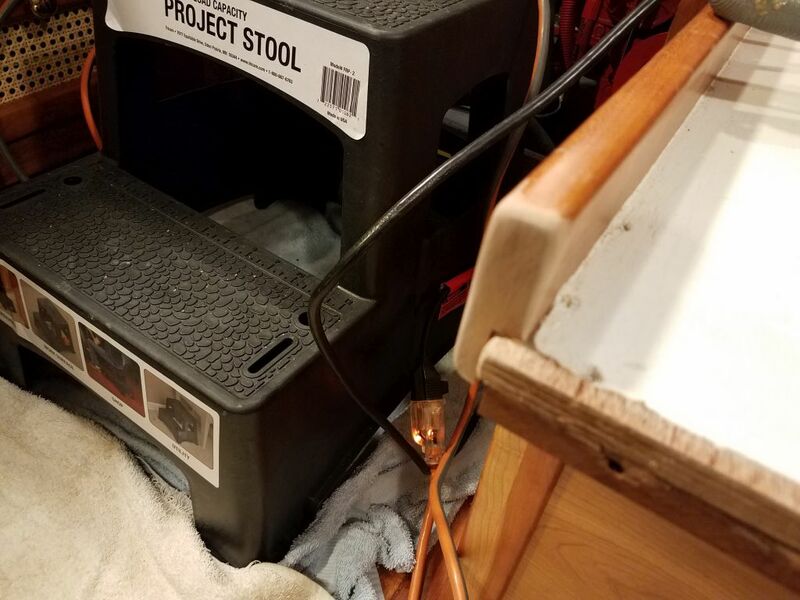 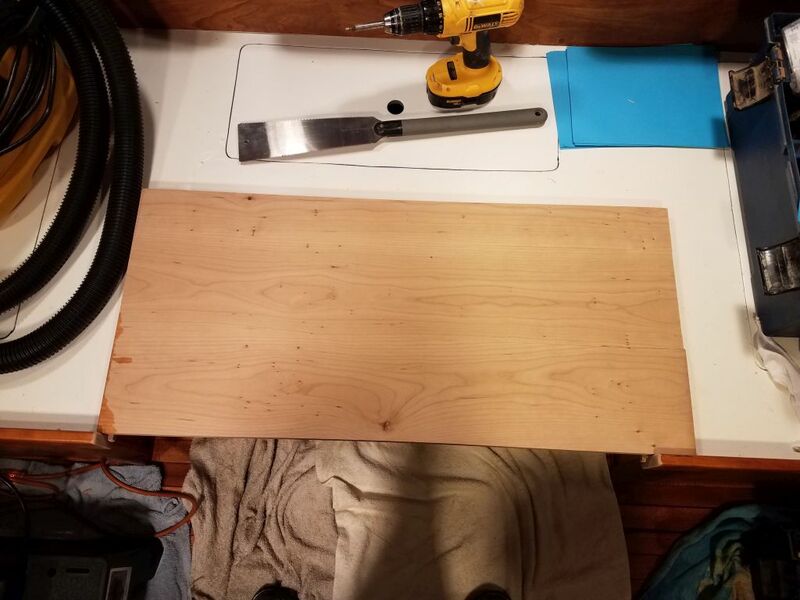 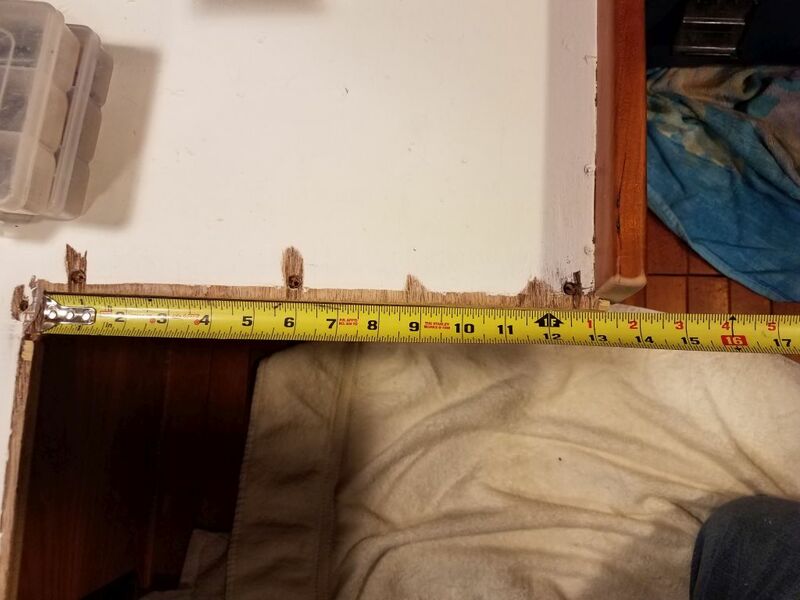 To lower the bearing surface enough so that the 7/8″ thick table top would fit flush when lowered to berth height, I added a plywood strip which, along with the 12mm thickness of the settee, would lower the installation accordingly. 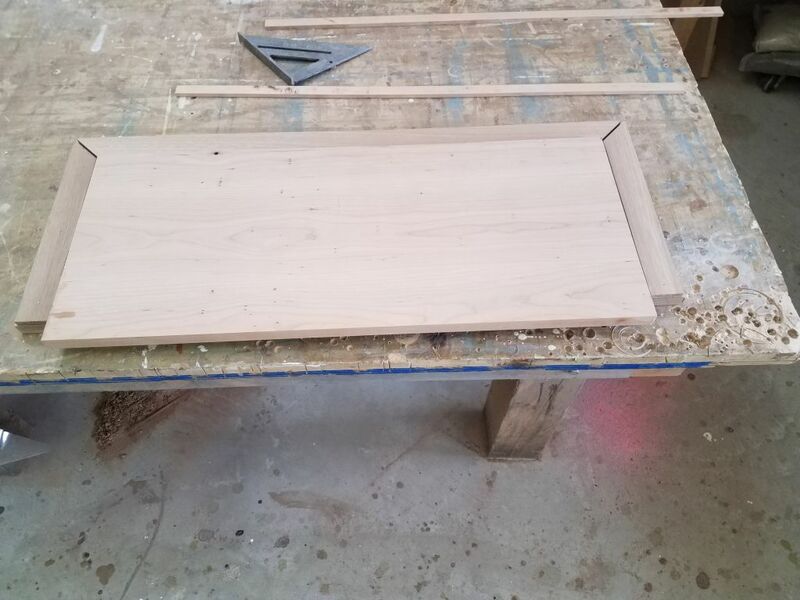 The plywood would not be seen in the final installation, and I secured it to the cherry with glue and brads. 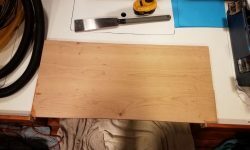 Allowing for the additional edge trim, and some space for a realistic fit, I cut down the table blank to its final size, bringing work for the day to a close.